In Madagascar, getting to the islands is half the adventure and island hopping remains an essential part of the Madagascar experience. 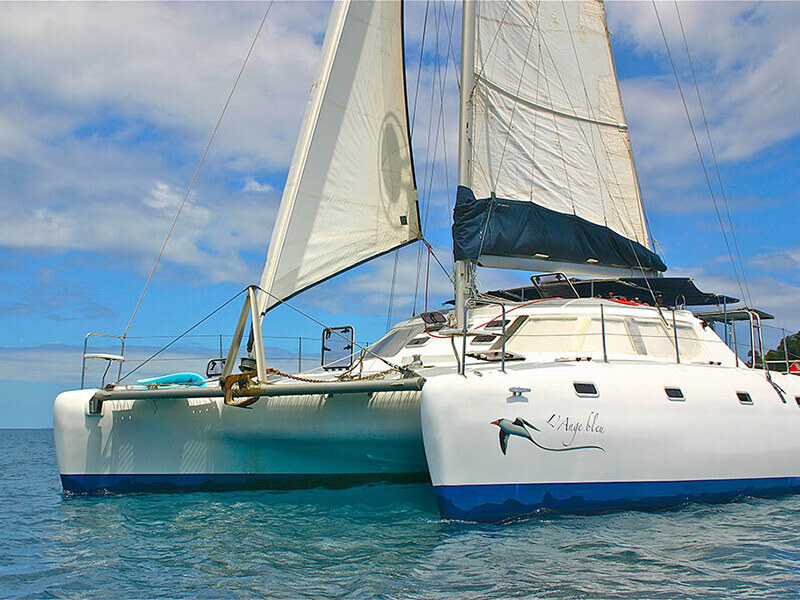 Whether you’re sailing into a quaint harbour, listening to the lapping sea while bathing on a sun-drenched deck, you will be filled with a sense of adventure. We suggest an itinerary visiting 2 or 3 islands in the Nosy Be archipelago, you choose the style of accommodation, we plan the routes and take the work out of your holiday. 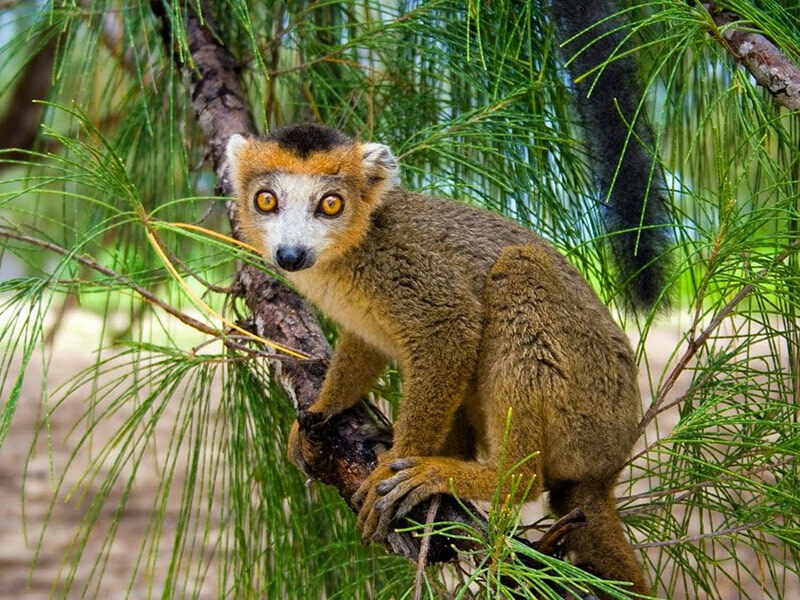 Madagascar is the world’s 4th largest island, measuring approximately 1571 km in length and 571 km across. The capital of Madagascar is Antananarivo or ’Tana’. 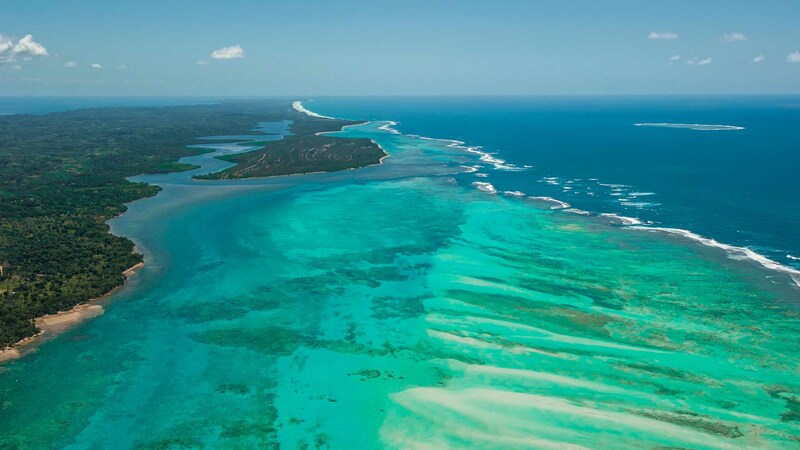 The surrounding attractions are; Nosy Be, Sainte Marie, Morondava, Fort-Dauphin and Diego Suarez. Some ecologists to refer to Madagascar as the “eighth continent”. Madagascar is that endemic fish of Madagascar include 150 species, 16 genera and 2 families, primarily inhabiting the island’s freshwater rivers and lakes. More than 670 species of terrestrial snail are endemic, as are a majority of the island’s scarab beetles, butterflies, spiders, lacewings and dragonflies. 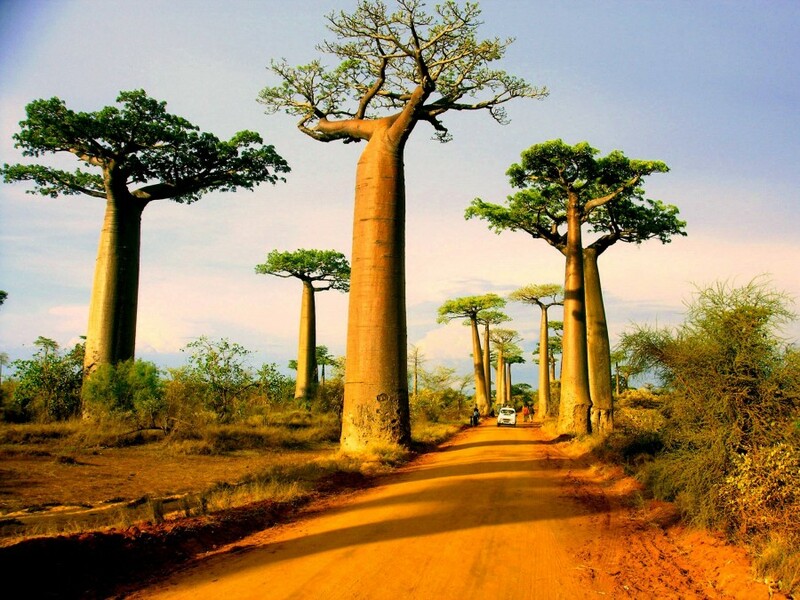 Environmental challenges Madagascar’s varied flora and fauna are endangered by human activity. 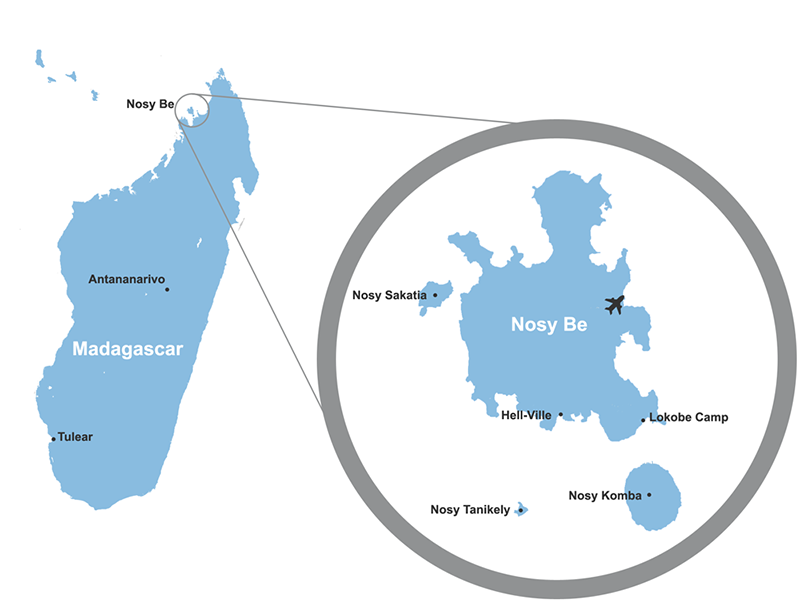 Nosy Be, also known as the ‘Big Island’, is situated off the North West coast of Madagascar in the Nosy Be Archipelago with a surface area of almost 300 square kilometres. The Island is better known as the Perfume Island, due to the large cultivations and processing of Ylang-Ylang essential oil. It is a volcanic island with 11 extinct volcanoes, currently acting as natural water reservoirs for cultivation and human consumption. The highest peak, Mount Passot, is 450 metres above sea level. Nosy Sakatia, one of the surrounding Islands is 2 kilometres off the North-West coast of Nosy Be -Scuba Diving at its best. The Lokobe Reserve nature trail is on the Southeastern side of Nosy Be, which has the best walking trials. Antananarivo is the capital of Madagascar with a population of 3 million people. ‘Tana’ is situated in the centre of the island, 4060 feet above sea level. It is Madagascar’s major international airport is situated in Antananarivo. The Sainte Marie Island is just off the Northeastern side of the main island of Madagascar. This island is just a one-hour flight from ‘Tana’. It is a long thin tropical island approximately 60 kilometres in length and less than 7 kilometres wide, with the small island of Ile aux Nattes, just off the southern tip. The historical ‘Pirate’s Haven’ story dating back to the 16th century includes graves marked with skulls and crossbones. Morondava is a city situated on the west coast of Madagascar, at the mouth of the Morondava River, where you will find the warm waters of the Mozambique Channel. Morondava is accessed by direct flights from Antananarivo and Fort Dauphin. It’s the gateway to the ‘Avenue of the Baobabs’, where massive baobab trees tower over the landscape. 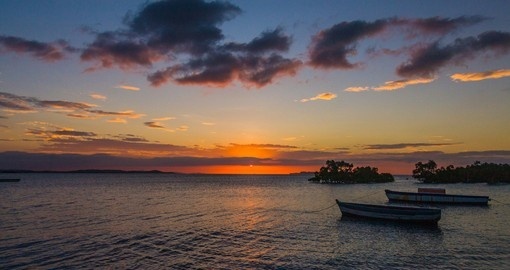 Diego Suarez is a port city in northern Madagascar and is situated on the second largest bay in the world. The main attraction is the Tsingy Rouge Park, situated approximately 60 kilometres south of Antsiranana near the town of Sadjoavato. 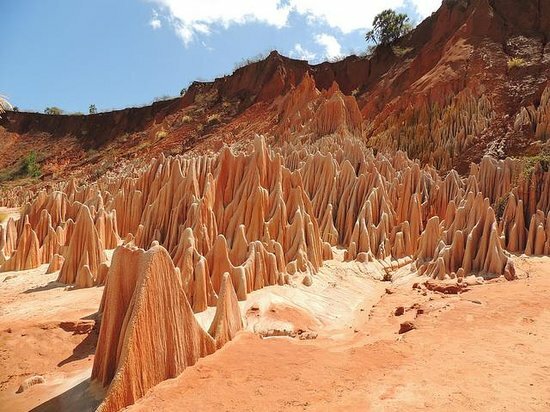 The red Tsingy are made of sandstone which is found uniquely in several areas of Madagascar. Nosy Be can be visited all year round and it can be divided into two distinct seasons. The dry season runs during the winter (May to October) and there is tropical rainfall from December to April. The weather does vary according to each region. The coastal areas are warm and enjoy average temperatures from 21°-26°C while the inland plateau is cooler (average temperature 13°-20°C) and generally dryer. The eastern and north western coasts receive more rain during the winter from the south easterly trade winds but the inland areas and western coast endure monsoon rainfall during the summer. The southern region is dry and barren with little rainfall, amounting to semidesert in some places. Depending on your interests, the Nature enthusiasts should go from late August to January. 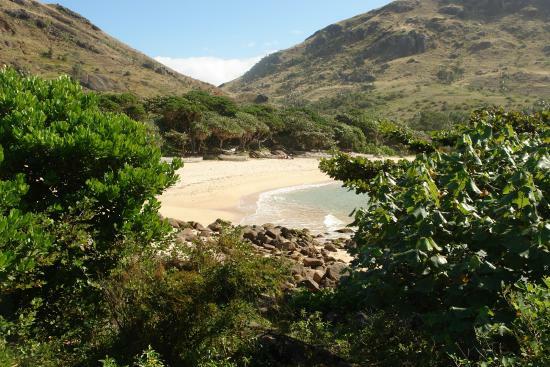 Certain parts of western Madagascar are not accessible in summer during December – March. Avoid the northeast in February as it is cyclone season and may occur during January to March on the East coast. July to September is also good for whale watching on the east coast. Air Madagascar serves 60 domestic airports. There are overland routes run by a few operators but due to the road conditions these can take a few days rather than a few hours and would involve overnight stops. 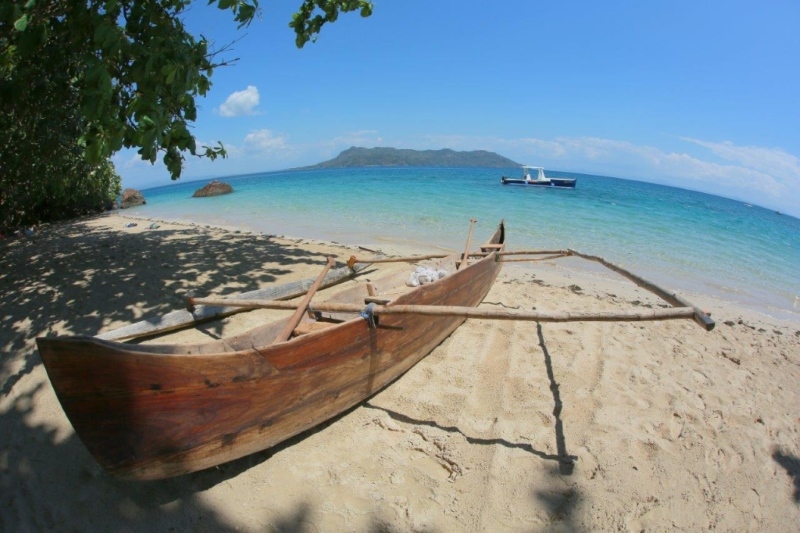 Airport transfers are arranged by Madagascar Island Safaris to and from your hotel. The Malagasy transport department has put rebuilding roads on their priority list. We do not recommend self-drive as the infrastructure is not yet in place. It is advisable to change some money into the Madagascar currency, Ariary, at the airport Bureau de Charge. Ariary can be converted back into Euros prior to leaving Madagascar at the airport Bureau de Charge. Do not take South African Rand to Madagascar. MasterCards are rarely accepted; therefore we recommend that you take a Visa Card, as most hotels will accept Visa. Airlink in South Africa currently offer a Sunday flight directly from Johannesburg to Nosy Be Island in the North. A daily flight operates from Johannesburg to the capital Antananarivo. Flight duration is only 3 hours. Air Madagascar offers the following flight to and from Antananarivo (Tana): Tuesdays & Saturdays with daily inbound flights to the main tourism areas within Madagascar. 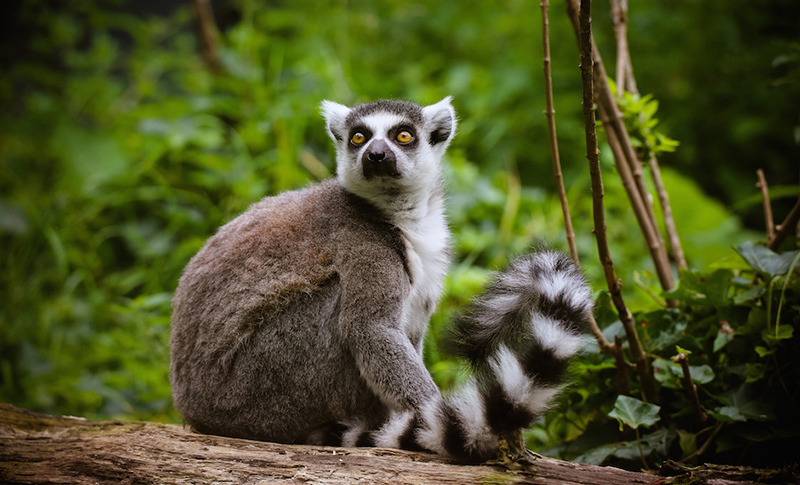 Madagascar visas can be obtained on arrival and cost on average 25 Euros per person. It is recommended that you draw an amount of Euros in cash from your bankers before departure to purchase the visa on arrival. A valid passport must be presented with a minimum of at least 2 clean pages. There are many taboos and traditions in Madagascar and if your guide asks you not to point your finger or photograph a tombs then please respect their wishes. If in doubt always ask permission before taking photographs. 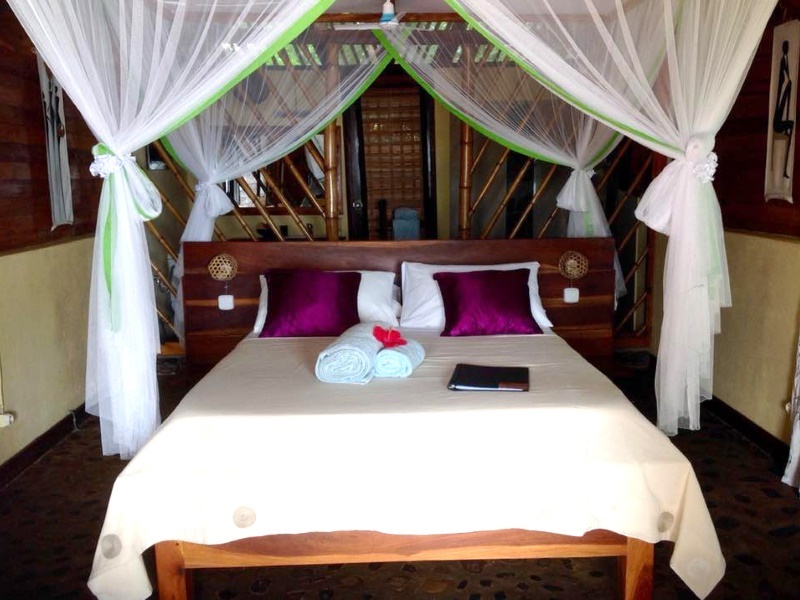 Madagascar is fairly new to the international tourist market, hence the Madagascar hotel accommodation may be standard, it may not be up to the same international accommodation standards that you would expect in South Africa or Europe. Be careful not to be persuaded or bullied into over tipping. The average porter at the airport only earns approximately 20000 Ariaries a week (about US $12). They have been known to ask for 10000 Ariaries just to push your trolley. Comfortable, casual and light clothing, a fleece tracksuit is an ideal all-round item. Well-worn walking shoes or sneakers/trainers are essential. Pack warm clothing for winter nights. Take insect repellent and protective wear for the tropical sun and rain. If you are planning an evening walk in the forests to spot nocturnal animals, a head mounted torch is an excellent accessory. A small backpack is always ideal for carrying your small personal items. A small basic medical kit is a wise idea as medicine packaging printed in French. When travelling, all medication should be carried in the original packaging for identification purposes if checked by customs. For chronic medication, you may be asked for a copy of your doctor’s prescription as proof that you are authorised to carry such drugs. Travel insurance recommended as it covers medical, injury, lost luggage, flights cancellation etc. Customs allowance – 500 cigarettes and 1 litre of alcohol.